In Part 1 of this topic, we defined and compared Machismo and Marianismo. In Parts 2 and 3 we’ll discuss the two archetypes against which women are judged: La Virgen de Guadalupe and La Malinche. In academic literature they are sometimes referred to as the ‘saint’ and the ‘whore’ respectively. Women are either perfectly godly or seductively evil. Let’s examine the origin of both these women, starting with the story of Guadalupe. The story of La Virgen de Guadalupe takes us back to Mexico in the year 1531. This was a time when the New World attracted both fortune-seekers and religious preachers desiring to convert the native peoples to the Catholic faith. Queen Isabella held the belief that upon the conversion of these thousands of new souls, Christ himself would return. The Bishop did not believe Juan Diego’s story and instructed him to ask the Lady to provide a sign to prove who she was. On December 12, while searching for a priest to administer last rites to his uncle, Juan Diego was visited by Mary again. He explained the Bishop’s request and Mary promised to provide the sign, and advised that his uncle would recover. Following the Mary’s instructions, Juan Diego went to the top of the hill and cut the flowers that were growing there, despite the freezing temperatures. He wrapped the flowers in his tilma, a poncho-like cape made of cactus fibre, and carried them to the Bishop. Juan Diego told the Bishop his story and opened the tilma letting the flowers fall out. The Bishop was in awe of the fully bloomed Castilian roses (native only to the Bishop’s home in Spain). 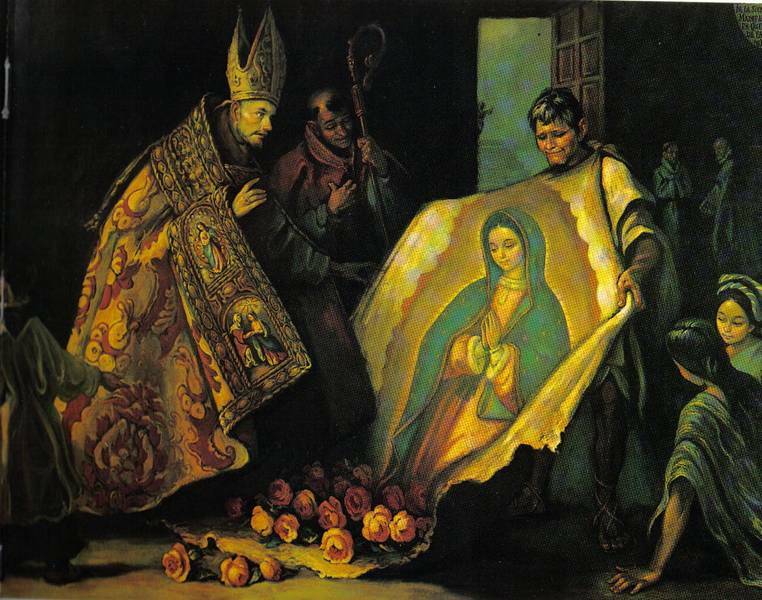 He and his advisors were further convinced of the veracity of Juan Diego’s tale when, on the tilma, appeared a picture of the Blessed Virgin Mary precisely as Juan Diego had described her. The bishop ordered that a church be built on Tepeyac Hill in honour of the Virgin. Juan Diego returned home and found his uncle’s health restored. For the rest of his life Juan Diego lived in a hut next to the church built in honour of Mary and took care of the pilgrims who came to the shrine. He was buried in the church, and his tilma can still be seen in the Basilica of Our Lady of Guadalupe. His existence was confirmed by the Vatican, and Juan Diego was beatified on May 6, 1990, and canonized on July 31, 2002, by Pope John Paul II. Numerous miracles have been attributed to him, and he remains one of the most popular and important saints in Mexico. Syncretism is the combining of different beliefs, while blending practices of various schools of thought. During the 1500s and 1600s, there was a mighty effort by the European colonisers to convert the indigenous peoples of the Americas to Christianity, preferably Catholicism. Forced conversion may have increased the numbers of Catholics, but there were still robust efforts at resisting conversion and clandestine retention of indigenous traditions and practices. In an effort to get more native peoples to genuinely adopt Catholicism, it would have to be made more attractive and less ‘foreign’. Out of this idea, the concept of merging cultures was born. The Virgin Mary is a cornerstone of the Catholic faith and needed to be fully accepted by the converts. In Mexico, the Aztec goddess Tonantzin was worshipped as Mother Earth, goddess of fertility, mother goddess. The Virgin of Guadalupe (similar to Tonantzin) is also believed to be an intercessor for married women who are having difficulty to conceive or carry babies to full term. She has been given the appellation of Protectress of the Unborn. The apparition to Juan Diego is said to have occurred not long after the conquest of central Mexico by the Spanish, at a time when the indigenous peoples needed hope. The notion of a darker-skinned Mary figure was critical to accepting Catholicism. Guadalupe is presented as neither pale like the Spaniards, nor as dark as the indigenous. She is a Mestiza, a mixed-blood. She is of the New World and represents the link between Old and New as their mother. Not only did this apparition look more like the indigenous (compared to the Europeanised images brought by the Spanish), but the symbols imprinted on the tilma were recognizable and well-known to them – the sun, the star constellations, the southern cross, and the placement of her hands indicating a gesture of offering. Some researchers have suggested that the word Guadalupe may derive from Coatlaxopeuh, meaning “the one who crushes the serpent”, perhaps referring to Quetzalcoatl (a creator deity who contributed to the creation of mankind). In the 1600s, the Basilica of Guadalupe was constructed at the base of the Tepeyac Hill, believed to be a site used for pre-Columbian worship of Tonantzin. Thus, bringing to a final meeting point two of the most evocative female figures in the Spanish and indigenous religious belief systems. The Guadalupe name and image of the Virgin have been unifying national symbols. The first President of Mexico changed his name to Guadalupe Victoria in honour of the Virgin and what she meant to the Mexican people. Father Miguel Hidalgo (independence fighter) and Emiliano Zapata (fighter in the Mexican Revolution) both led their respective armed forces with flags emblazoned with an image of Our Lady of Guadalupe. In 1999, the Church officially proclaimed her the Patroness of the Americas, the Empress of Latin America. Guadalupe continues to be a mixture of the cultures which blended to form Mexico, both racially and religiously, bringing together people of distinct cultural heritages. Mexican literary greats have made some memorable comments on the Mexico-Guadalupe interrelation. Novelist Carlos Fuentes once said that “you cannot truly be considered a Mexican unless you believe in the Virgin of Guadalupe.” Nobel Literature laureate Octavio Paz was credited as saying, in 1974 that “the Mexican people, after more than two centuries of experiments, have faith only in the Virgin of Guadalupe and the National Lottery“. Paz also said that if the macho in Mexican society is represented by the conquistador, then the Virgin “is the consolation of the poor, the shield of the weak, the help of the oppressed.” The truth in those words cannot be ignored. This figure, the syncretized and much revered Virgen de Guadalupe is the form against which Latinas are compared. The perfect marianista, the perfect Latina, should strive to emulate the virtues and goodness of the Holy Mother. Failure to attain perfection brings shame and disgrace and a comparison to the wretched Malinche. We will explore the origin of La Malinche and the negative implications of that construct in the next part of this series. I love learning new things every day! I read a bit of Juan Diego’s story, but not the full thing like this. I’m so glad you enjoyed it. It’s a story I first came across in my Catholic schooling but got to know better in my university schooling. Lol. I remember learning about Our Lady of Guadalupe from an episode of the Wishbone TV show in the 1990s! Haha! It was one of my favorite shows. Most of the episodes are on YouTube!